There are plenty of poetry competitions around but one we at StAnza are keen to support is the Troubadour International Poetry Prize, not least for its £3,500 cash prize pot and range of runner up prizes. This year the judges are Imtiaz Dharker and Michael Symmons Roberts, two StAnza favourites, who will be reading every poem submitted. The winners will also get a chance read with them at the Troubadour in London later this year. 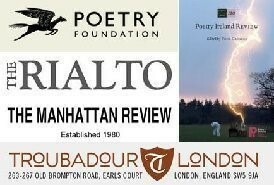 You can see the 2016 winning poems & judges' reports on this poems page. And good luck to everyone who submits!